We haven't had any snow for a few weeks now and this pic was taken about a month ago during a bit of a storm. 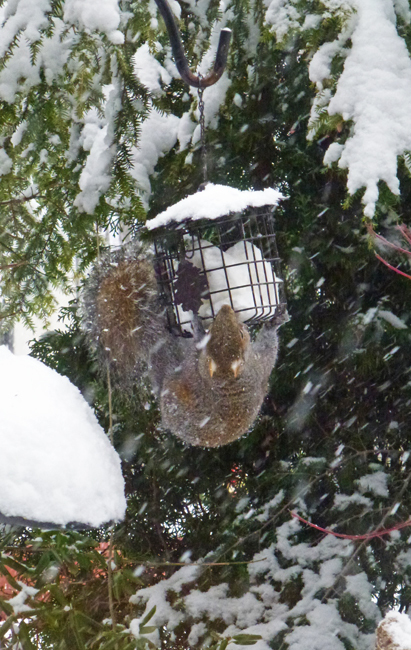 This grey squirrel was determined to have a bite to eat and actually hung from that suet feeder for several minutes while he munched away. Those little devils are so agile. Great action photo. Squirrels are great fun to watch. And they are very determined to get what they want, especially when it comes to food. This is a great photo and fun post! Have a great day! Hello, the squirrels seem to be able to anything if it comes to eating. Cute photo, the snow looks cold. Thank you for linking up and sharing your post. I appreciate your visit and comment. Happy Saturday, enjoy your weekend. Happy Easter to you and your family. That seems like such an uncomfortable position to be in while eating but, I guess squirrels are more flexible than people. What a gymnast! The snow seems to add sparkle! Squirrels are some of the most determined rodents out there. Happy Easter WE to y'all. ...they will do anything for a free meal. Great photo! Those darn squirrels are so smart and determined. Nature never gives up; or bores! They have an unending list of talents! There is nothing those evil beasts won't do to get a meal.